At TCS Textiles Pvt. 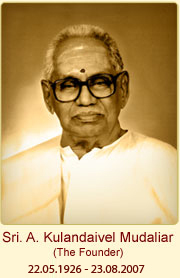 Ltd., we uphold the visionary values of our founder Shri.A.Kulandaivel Mudaliar. Though he started with modest beginnings, he envisioned a grand future, one that would transcend time for generations to come. It was his vision that revolutionised a humble weaving unit into what is today, a conglomerate with diverse business interests. His enterprising spirit continues to inspire us to scale new heights of success in all our endeavours.